We got commercials for some of the 1H14 LEGO Technic sets, and here they are! At the same time you can also access an interactive mini movie, where you can choose your vehicle and navigate through several pathways to unlock rewards for the web game. ...with a mind blowing 3,253 seconds! CONEXPO-CON/AGG is a trade show for the construction industry that takes place every three years. The 2014 edition closed yesterday in Las Vegas and Volvo CE was present of course. Among the several Volvo press releases for this event, there is one about their partnership with TLG to design the 2014 flagship - 42030 Volvo L350F Wheel Loader / A25F Articulated Hauler. You can read the complete press release here, or download it from here. “We are extremely happy with the outcome, both from a functional and design point of view. 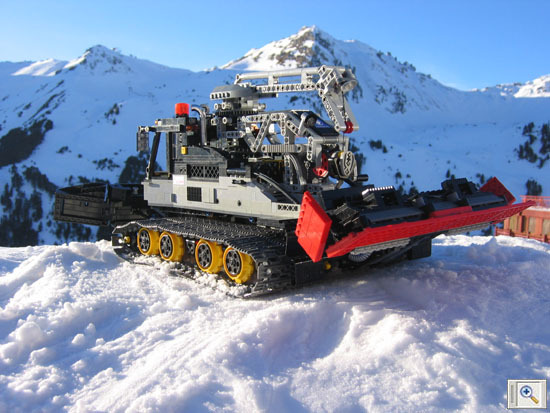 LEGO Technic has captured the profile, expression and power of the machines in an incredible way, as well as including lots of cool features like a heavy lift boom and high dump height. The LEGO Group also shares our core value of safety, and these machines have been thoroughly tested,” says Mats Bredborg. In the meantime the VOLVO CE Magazine (Spirit) also features the same subject. Read it here. From both articles we learned something about the underlying development process. Also that there was a concept demonstrator shown to Volvo, apparently designed by Anders Gaasedal Christensen (designer of the unforgettable 8043 Motorized Excavator who meanwhile moved into MINDSTORMS endeavours) and that the final 42030 model was designed by the LEGO designer Uwe Wabra who spent eight months working on it. We got some promotional videos for each new 1H14 LEGO Technic set. Some references made in these videos, seem to address the specific interests of the LEGO Technic fans community, like the respective Designer name, new elements, etc.